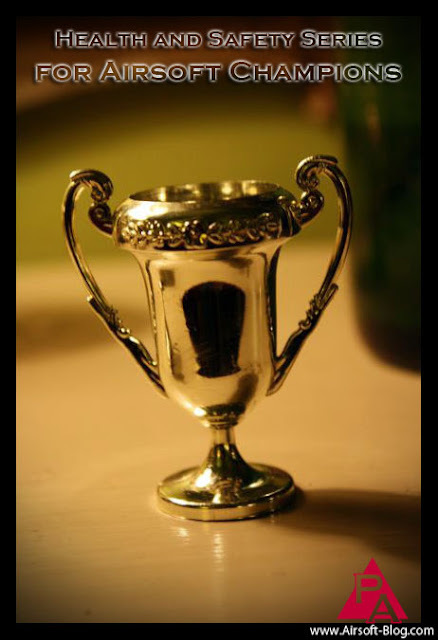 Awesome Trophy Image Copyright: Julie Rybarczyk, Used in accordance with Creative Commons License. So I know we've all probably been told many times before by others that we need to drink lots of water during Airsoft games, but it kind of seems like it's just one of those things that we all sort of ignore and/or brushes off this advice because we hear it so often. So I thought I'd spend today's installment of my new Health and Safety Series for Airsoft Champions to shed a little bit more light on why hydration is so important. This is just a reminder that my "Health and Safety Series for Airsoft Champions" is exclusive and ONLY for those Airsoft players who are not satisfied with just looking cool in the parking lot or staging area at games. This series is for Airsoft players who like winning and are willing to take the necessary steps to ensure that happens each and every time they suit up and put fools on blast. If you like losing to players that could be otherwise defeated because you don't put in a little time and effort in the off-season to tune-up and train the most valuable weapon in your arsenal (your mind and body), then please check out one of my latest gun reviews or Airsoft news updates here on the Pyramyd Airsoft Blog. This series about winning is not for you. Click to get tips on how to increase your likelihood of being a well-hyrdated Airsoft Champion after the jump. Before I get into how to win, here are some things to be aware of when it comes to heat-related illness. Number 1: I'm not a medical professional nor is Pyramyd Air. So it's best to take this information with the proverbial grain of salt and consult with someone who IS a medical professional on things like this. - decrease in skin elasticity - Skin does not return to original state quickly or at all when pinched. Best place to test is the skin on the back of the hand or knuckles. If you experience any of the following symptoms or see that one of your fellow Airsofters is showing signs of them, it'd probably be a good time to seek emergency medical attention. - Skin stops sweating - If you get to this point, it's too late and you're in big trouble. I'm always a fan of being proactive, rather than reactive when it comes to any situation. DISCLAIMER: I said I was a fan of it. I didn't say I was good at exhibiting proactive behavior. 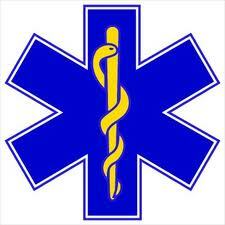 - Abstain from consuming alcoholic beverages immediately before and/or during the day. Unfortunately, I see it all too often around some of the unregulated fields I've played at which not only puts those people at a higher risk for dehydration but also sets a poor example to the younger players that are at the game as well. 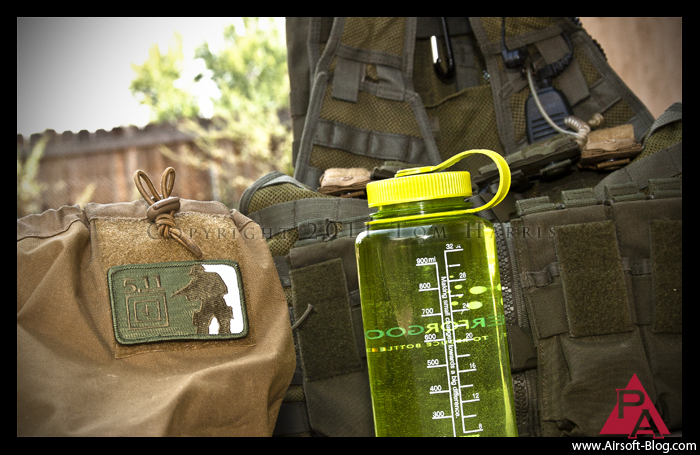 - Start hydrating (drinking fluids) BEFORE you head out to the Airsoft game for the day. I usually try to drink at least the recommended daily amount of water by health experts, which I think is 8 fluid ounces a day. But Google that. I usually 32 ounces of water the day before a game, but you may not need this much. Or you may need more than this. Basically, use your judgement. - Eat a healthy meal in the morning before the game, and pack small meals or snacks to eat throughout the day. Don't just eat one giant meal at lunch time. Proteins & a little bit of carbs would be advisable. More on diet at a later date. - Bring at least 32 ounces or pretty much one litre of water (not just sports drinks like Gatorade) to drink throughout the day of the event, and double that if you sweat profusely like I do. This is just a minimum though. Normally, I bring 2 gallons (I usually drink 1.5 of those gallons during an all-day, outdoor game). That doesn't mean I'm better than you. I'm just a big dude to begin, PLUS I lose several pounds of water weight from sweating during games, so I have quite a bit of fluids & electrolytes to replace. Speaking of electrolytes, I also like to mix in a bottle or two of the Gatorade G2 stuff. Powerade and a number of other brands work as well, but in my head, Gatorade is best because they were one of, if not THE, original inventors of the sports drink and the whole electrolyte replacement thing that is so important during exercise. The more you sweat, the more fluids and electrolytes like sodium that you will need to replace. 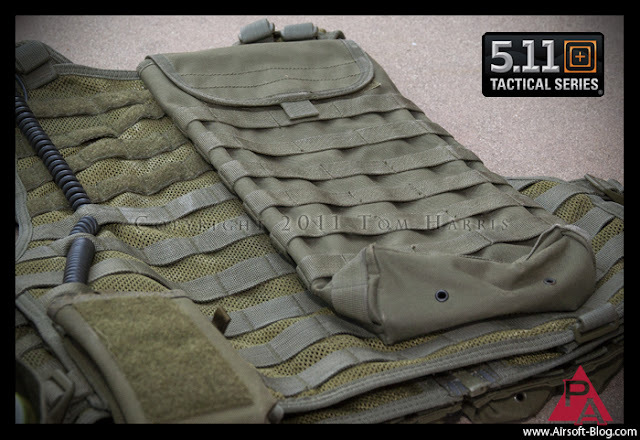 - Maybe leave that plate carrier or other tactical vest at home and just run a minimal battle belt rig with just the essentials like pouches for a water bottle and extra magazines. - If you start noticing some of the earlier signs of heat exhaustion or dehydration, the best thing to do is put your red, "Dead Rag" on your head, take a knee in some shade and get a drink of water from your water bottle or hydration bladder. I also wouldn't just walk off without telling a friend or teammate in case your symptoms get worse while you're by yourself. Carry liquid with you during games. Especially if the AO where you actually play at is a hike from the parking lot or staging area where you might normally keep your water. There are a number of "tacticool" pouches out there to attach to MOLLE web platforms specifically designed for water bottles and hydration bladders. 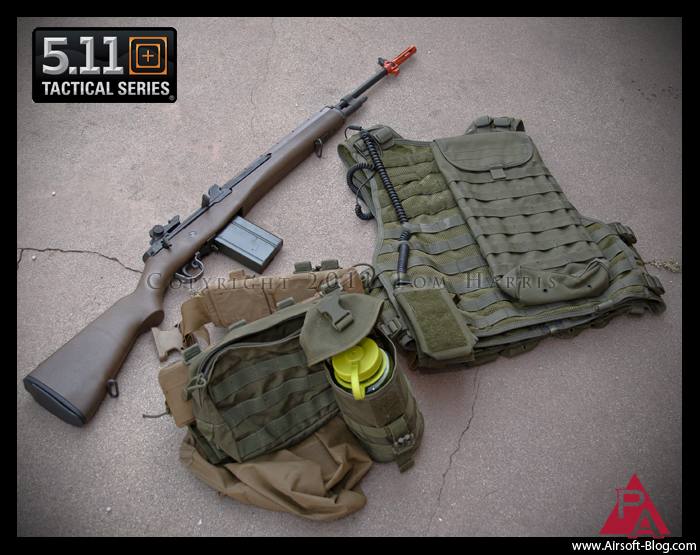 5.11 VTAC Radio Pouch, 5.11 VTAC LBE Vest, WE M14 GBB Rifle. I also have a Condor hydration bladder pouch attached to the back of my 5.11 VTAC LBE Vest for whenever I want to run a hydration bladder instead of a water bottle. 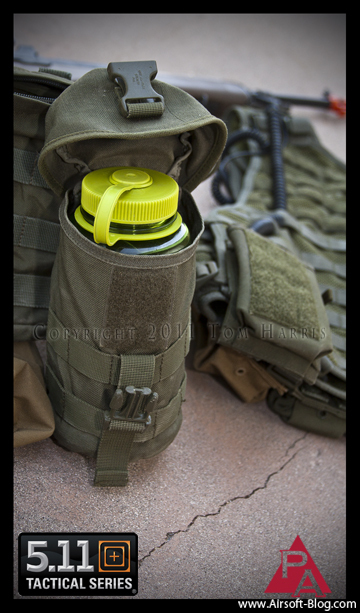 The hydration pouch is also useful for storing your external air tank for HPA-powered rifles like the new PolarStar PR-15 EPAR rifles or for HPA-powered sniper rifle setups when you're not using a bladder. And while I hate to say to it because it's almost blasphemy to recommend the act of staying home instead of playing Airsoft, one SHOULD consider the idea that in some conditions of extreme heat or humidity, it might be the best idea avoid playing altogether. However, if you have fields in your area available for it, rather than totally missing out on getting some trigger time during the weekend or whenever your time off is, consider attending a night game when temperatures have cooled off, or perhaps playing early in the morning before it gets too hot, taking a break for the hottest part of the day which is usually from noon to about 4pm, and then reconvening in the late afternoon for more shoot 'em up. Just trying to throw ideas out there. There's not a whole lot worse than having to go to work or school all week and then NOT be able to play Airsoft over the weekend because it was too hot. HOWEVER, one thing that is worse than that is getting a heat-related illness and/or dying from the heat. No bueno. Stay safe out there and use good judgment. Using bad judgment blows. Take it from an expert.